It is true that my husband has a birthday tomorrow, and that he is careful custodian of the dog’s appearance. It may well be that we considered buying the dog an outfit in his honour. But until I stumbled on the pet parlour, nestling at the back of the huge pet superstore in our home town, I had not dared hope we might get an appointment. Is it the same where you are? 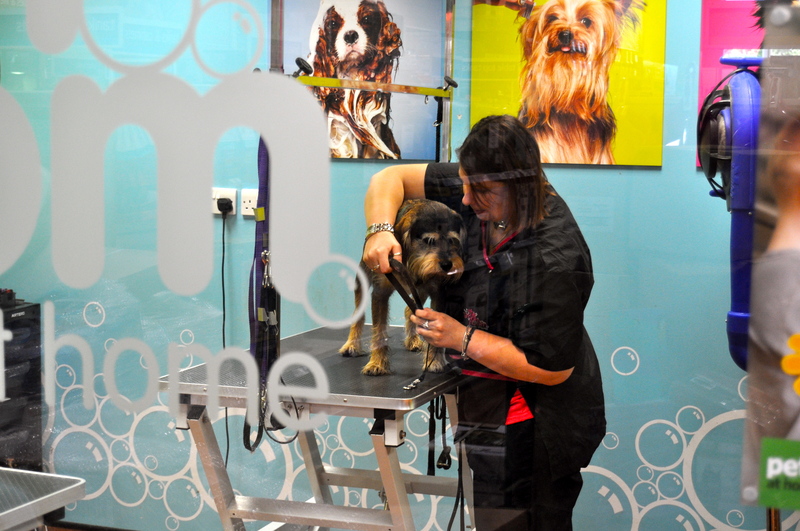 Are dog grooming services, static and mobile, booked up insane periods in advance? Why is that? Are we, even in the teeth of a double-dip recession, pampering our pooches when our own appearance could do with more than a minor tweak? The answer to that question is Yes. I could bring out all the justifications I used: Macaulay has not had a haircut for a year or so; he looks like John Lennon in the very hairiest days; he could write the Karma Scratcha, he is scratching so much and in so many positions. But really, it came down to impulse. The parlour has a glass facade and, having gawped at all the bunnies and the guinea pigs and the hamsters and the fish, I gazed through the glass to see a small captive Yorkshire terrier on a table being blow-dried, his eyes sending me a heartfelt canine SOS and his little body trembling. Get me, he signalled with every sinew in his small body, out of here. Now. This was the place for Macaulay, I decided promptly. I walked straight in and discovered they had just one cancellation, for the following day at nine am sharp. The dog pottered happily through the small pets part of the store but when his paws crossed the threshold of the parlour everything made a stab at walking in the opposite direction. It was all attached to a lead: resistance was useless. And I will never, in all my born days, forget the look on that dog’s face as I left and looked back through the glass. Now, Macaulay is a preppy doggie once more. He even smells nice. It is like having a well-groomed stranger in the house. Right up to the moment he begins going through every single position in the Karma Scratcha. Posted in Macaulay The Dog storiesTagged dogs, grooming, parlour, petsBookmark the permalink. Awwww! He is such a cutie! Awwwwwwww, Mac is so adorable! Over here in the US my sister has to make an appointment at least a week in advance for Thurber to get groomed. People-wise, my colorist and stylist are not available to do me for two weeks. I look like Cousin It these days. Macaulay would growl if he saw me right now. No necessarily: he lives with me, another Cousin It, Laneadventures. He’s accustomed to the shaggy look. We shall, IE. He’s out running in the forest right now. Ooooh, have a happy birthday, Jan! You are correct. Fragrance is not Macaulay’s chosen medium. Great groom, Macaulay! Give the world the same look you gave your mistress and you’ll get anything you want. It’ll help the contorting immensely. 😀 I shall pass that sage advice on, Amy. What a darling transformation for the wee beastie. Wish Phil the HAPPIEST of Birthdays from BFF, me, mom, and Tigger too! I love it when birthdays fall on Fridays . . . practically inviting a weekend long celebration. Thanks, Nancy. Barbecue this evening, bar torrential rain. Oh, poor Macaulay! How could you replace him with that smaller dog, even if it does look a lot more reputable? That must be quite some achievement, Col! haha – love the way you see the poor trembling dog in the groomers and decide this is where Macaulay must be 😉 My dogs tremble too – grooming is traumatic for them, but must be done because my attempts make even a labradoodle a bit ugly – they are off to the groomers next Thursday, by coincidence – the groomers rang me to see if they needed doing (they will even pick them up) – how could I refuse! Loving the dog-based posts over at yours, not to mention your current avatar, Gabrielle. I’m a huge fan of the Bryden pooches. He’d love it on your farmy, Celi! Lol 🙂 The doggie has got the prefect grooming before birthday bash. How about Phil? I’m sure I’m mistaken, but was she using straightners? Aw, he looks so dapper! Those pleading eyes, though, poor guy. Gwynn is always itchy for a few days after he gets groomed. Itchy, and surprised at how much air circulation he gets in previously protected bits, I think. He does. Like a middle aged man with seventies coiffure who has a modern makeover. With two Yorkies, £25 a pop and several cuts a year, we bought dog shears. I do them now. Not brilliant, but serviceable. Macaulay’s imploring you not to leave him. But he looks so darn adorable when it’s all done. I wonder if he didn’t swagger just a bit, knowing how terrific he looked. “…booked up insane periods in advance?” Hmmm. Unfortunately I can relate to this.